Taco Truck Battle Heats Up in Los Angeles The trucks have long been a favorite spot for cheap Mexican food in Los Angeles. But a new law goes into effect next week in Los Angeles County that truck owners say could drive them out of business. Pulitzer Prize-winning restaurant critic Jonathan Gold gets paid to eat wherever he wants. And yet, several times a week he chooses to pull over to the side of the road and eat food served on a paper plate — out of a truck. "I've probably been to 3,000 trucks in my life," says Gold, who writes for the alternative newspaper LA Weekly. "It's a hobby, you might say." Many Angelenos share Gold's love of the quick and inexpensive meals, with blogs and online maps dedicated to the quest for the perfect taco. Not everyone is so enamored, however. 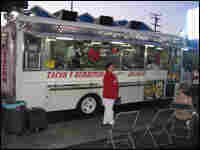 Los Angeles County officials recently passed a law that makes it a misdemeanor to park a taco truck in the same place for more than an hour. Violators face penalties of up to $1,000 in fines or six months in jail. "The potential of a jail sentence and/or a $1,000 fine for parking to sell food? It's ridiculous. It's outrageous," says Phillip Greenwald, an attorney hired by a group of truck owners to fight the new rule. L.A. County already has a similar law on its books, but it carries a nominal fine — $60 for parking a truck longer than 30 minutes — and has been rarely enforced. The clampdown comes in the wake of complaints from some restaurant owners that the trucks pose unfair competition. Maria Melgar owns the Birrieria Guadalajara restaurant in East Los Angeles, which has one of the highest concentrations of taco trucks in the county. She says the loncheras are siphoning off customers. One recent afternoon, Louis Herrera, who runs a car dealership across the street, was the only patron at Birrieria Guadelarja. "After six o'clock, this restaurant is closed because that's the hour that the catering trucks come in," says Herrera, who's also president of the Greater East Los Angeles Chamber of Commerce. "They can't compete with the prices of the catering trucks. Their prices are so much less because their overhead is zero." He also accuses the trucks of not paying taxes or adhering to county health regulations. "That's not competition," Herrera says. "That's not being fair." Down the street at Tacos El Galuzo, one of many popular taco trucks in the neighborhood, owner Juan Torres sees the situation differently. He says the new law could ruin his business because he depends on repeat customers who know where to find him. Like most "destination" trucks, Tacos El Galuzo is always parked in the same spot. "I have permits for everything," Torres says, adding that the county health department inspects his truck every few months. As a line of customers waited for 90-cent tacos and $3.25 quesadillas, Torres notes that he pays taxes and has a business license. He says he also pays rent — $700 a month — to the business that shares the curb. Torres isn't willing to ignore the threat to his livelihood. He says he has helped mobilize about 150 taco truck owners into a sort of "taco resistance." When the law goes into effect May 15, they vow to stay parked — right where they are.